You need to give us at least 8 weeks to make your quilt. But if there is less than 8 weeks until you need your quilt, call or e-mail us and see if there is still time for us to make your quilt. These T-shirts are generally collected by the parents. Over a number of months or years, Mom or Dad “disappear” T-shirts from the laundry for the quilt. Although it is wonderful to surprise the graduate with a quilt, sometimes working with the students will produce a better quilt with more of the T-shirts the student wants. Also, the student may be willing to part with more T-shirts than you could otherwise collect. Note: Not all graduation quilts are made with school related T-shirts. 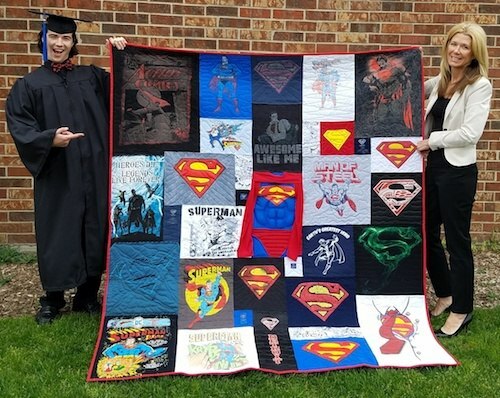 In the photo above, this graduate's mom made his quilt from his collection of Superman T-shirts. If you are short on T-shirts, considering asking aunts, uncles, cousins, grandparents and friends to donate a T-shirt that holds a memory for the student. Rest assured that the younger brother or sister will not be short on T-shirts when it is their turn to graduate. They will start saving their T-shirts the minute they see their sibling’s quilt. Should I tell my graduate about his or her quilt before it is made? You might get more T-shirts than you could otherwise sneaking them out of the wash. Your graduate may have a T-shirt that he/she hates and you might not know it. And if we put that T-shirt in the quilt we might have a bad situation. Once a T-shirt is in the quilt - it is in the quilt to stay. There is no removing T-shirts after the quilt is made. Your graduate might have color preferences for the backing other than his/her school colors. Surprise factor - and it is a great surprise. You have been collecting T-shirts from him/her for years and you have enough variety to make the quilt. You know the color preferences of your graduate and feel confident that you know what color they would like on the back of the quilt. Which ever direction you choose, your graduate will be wowed by his/her quilt. 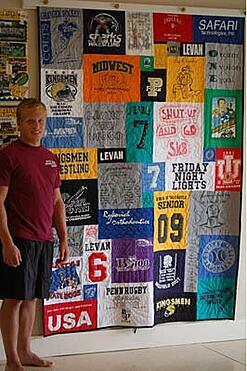 If you would like to talk about the quilt ahead of time and still have it a surprise, you can tell your graduate that you would like to do something with his/her T-shirts and ask for his/her input about which T-shirts and what colors he/she likes. He/She still will be surprised and crazy about his/her quilt. Some parents show their kids this web site and others just talk about a project in general. Should I have the quilt made to fit an extra long twin size mattress for the dorms? Kids generally are only in the dorms one or two years. After that time they are left with a very long and skinny quilt. That shape is not very practical for other uses. Most kids never make their beds in the dorms - unless they know you are coming for a visit. If you have a son, there is about an 80% chance that you will not even let him take his quilt out of the house until he is married. We have been doing this for a long time and over and over Moms think that they will send the quilt to college with their sons and then call us to say that we were right, it is not going to the dorms. Some dorms don’t have the longer beds. 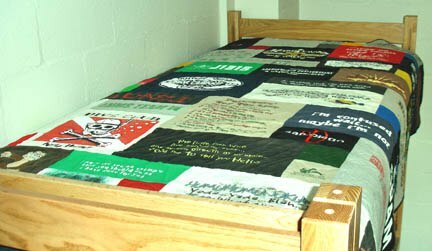 If you would like the quilt to fit a long dorm bed and be useful after dorm life, we suggest a quilt that is 80" x 88" (Estimated 35 to 45 T-shirts). This is long enough for a longer bed, but wide enough that it will be usable on other beds in the future.